I worked on refining the workspace over the weekend, and I documented this with a few photographs… below is my attempt at time-lapse photography. As you can see in the transition, my office also served as a storage room for all of the clutter in my house. I am an ardent list-maker, and there were lists scattered all over the desk and the floor. The desk and table were not aligned in such a way that maximized space. Gradually, I sorted through a lot of old binders and notebooks from my master’s program and found a new home for them. I also rearranged some plants; now that the days are getting longer, they will get enough sunlight in their new places. There is a lot of floor space now, which ironically now has five distinct piles of work (one pile consists of research articles I printed out for a study I am currently conducting… they need to find a binder). 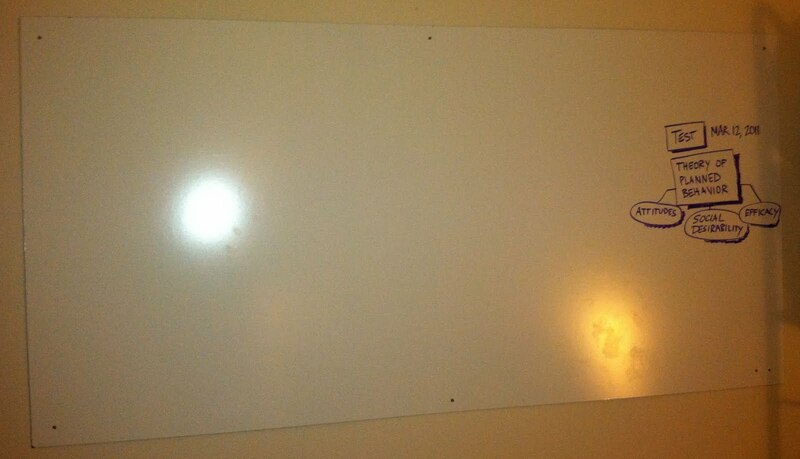 Another important feature, to address my list-making habit… I purchased a 4′ x 8′ piece of masonite dry-erase board from Home Depot for $12. They cut it down to 3′ x 6′, and I screwed this to the wall. I’ll pick up the charge when I lose my security deposit, but until then, it will be worth it. I have already filled it with three lists, and a complex diagram of the website I am currently redesigning. I can take a picture of a list with my iPhone so I have it with me at work, which seems to simplify the list-following process. Next Next post: "You cannot write up intuition and send it to the White House in intelligence reports"